Legacy Tales: Mercy of the Gallows Collector’s Edition is rated 3.9 out of 5 by 95. Rated 5 out of 5 by 8dognight from Beautiful and Challenging Game I’m reviewing Legacy Tales: Mercy of the Gallows because it is one of my all-time favorite games. I do not ordinarily like pirate themes in casual games; in fact, with few exceptions I avoid pirate themes. Legacy Tales: Mercy of the Gallows defies that prejudice for the reasons spelled out below. For one thing, the attention to authentic detail elevates this game above the ordinary. For another, the story is not kicked off by a kidnapping, instead we have twin disappearances and deaths to solve. William Van der Decken, a sea captain in the 1700s who devoted his successful career to securing Dutch trade routes from the scourge of pirates, and Isabelle, his mysterious wife, lived harmoniously dividing their time between their ship the Batavia and their castle. As chatelaine, Isabelle was industrious and charitable until becoming more and more withdrawn from her husband and community until one day she disappeared. Thereafter, the captain vanished as well; his body was later discovered under grisly circumstances. The story progresses via a series of treasure chests unlocked by gold coins scattered throughout the game world. The chests contain both inventory items and smidgens of back story. One of the great qualities of the game is that intriguing historical tidbits integral to the narrative are interwoven but never overpowering. Another unexpected enrichment is that clicking on items which do not have an icon change will often produce a comment on them, as might happen in a large file adventure, so remember to try this, particularly once you get inside the castle. The environments are presented with stunning attention to detail. When you eventually get to the screens set on the sailing vessel you will find yourself aboard a scrupulously rendered version of (I think but can’t be positive) the actual replica Batavia built in the Netherlands around 25 years ago. She carries 10 sails and 32 guns and would have been more than capable of dealing with scurvy pirates. Back on land and earlier, in the castle tea room is a French gilt salon suite with tapestry, maybe Aubusson, upholstery, and I would love to know what the dining room china is. It doesn’t seem to be Delft, but then the Van der Deckens might have had Chinese export porcelain as well. I mention these seemingly trivial features of the settings to highlight the love and work ethic that so clearly went into every scene in Legacy Tales: Mercy of the Gallows. Many of these environments are a clever blending of precise artwork with photographs. The puzzles are doable; a few required some thought, and I like that. You can skip if you want. I did have to consult the strategy guide to find several of the coins, and the difficulty in locating so many of them is for me the only weakness in the game. In general, the HOs are visually pleasing and the objects are harmonious with the ambience of the particular scenes. The voice acting is professional and never grating. The music is melodious, fits the mood of the game, and is not an endless loop of sea chanteys. I listened to the music as I played and did not turn it way down to a murmur as I usually do. 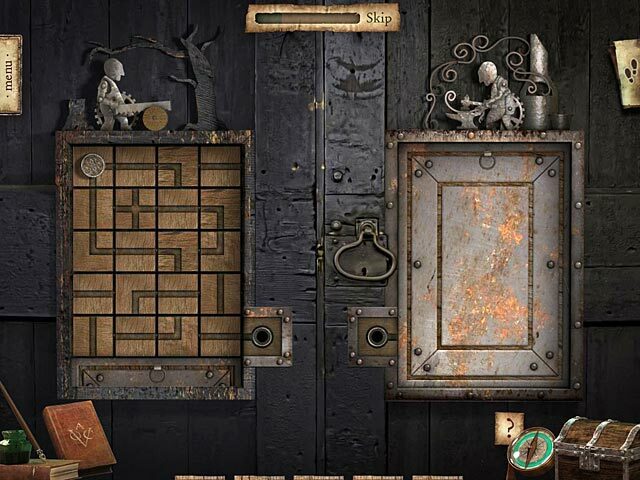 Legacy Tales: Mercy of the Gallows is as a good a game as I have encountered playing HOPAs, and over the last nine or ten years I have played a lot of them, including the more widely acclaimed games that I along most players would agree are stand-outs. 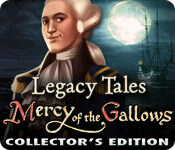 Legacy Tales: Mercy of the Gallows is one of them. Don’t expect a breakneck pace and do expect to think a little. Rated 5 out of 5 by crisgori from Still nice I've bought this game some time ago and I've replayed it after a while still founding it very pleasant: wonderful graphics, nice puzzles and HO, lenght and a good amount of backtracking. Looking forward for a sequel. Rated 5 out of 5 by agbosche from LOVED It! This game was so much fun to play. I loved everything about it. The map was quite useful also. Some of the coins were quite difficult to locate but I managed to find them all.Hours of great fun. Rated 5 out of 5 by Dahlia2012 from The Perfect Pirate Adventure Just completed the bonus and I have to say, this game was a thrilling bit of perfection. 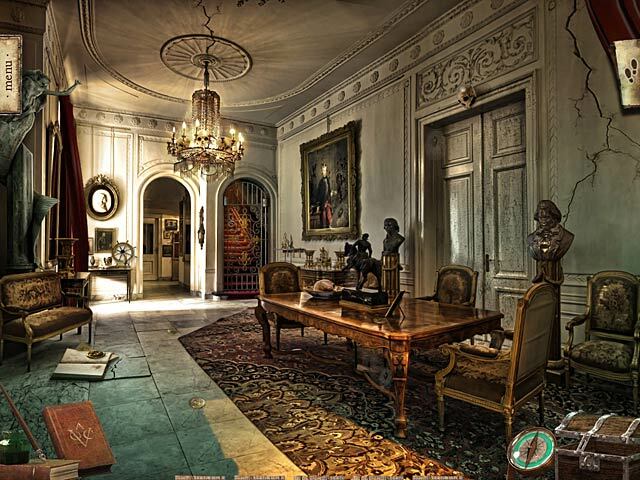 The graphics were beautifully drawn, the locations easy to navigate, the storyline fabulous. The story kept me "hooked" (argh matey!) all the way through and I think this is what sets this great game apart from others. I couldn't wait to find out what happened to Isabelle and her husband Captain William. The story is narrated by an actor with a Scottish accent and it's just enough voiceover without going overboard. I like the minimal voiceover, so thanks to developers for that. I managed to complete most of the minipuzzles, some "stumped" me, though and I had to skip. The minis were all standard ones us gamers have seen before. The HOGs were very challenging which I love. There are a couple of different types of HOGs and I especially enjoyed the "find two of this and two of that" HOG. There's a map and a hint button which doesn't always give you the best direction in where to go or what to do next. I had to find hidden coins throughout the game in order to unlock treasure chests scattered in different locations. You have to be able to unlock the chests or you can't progress. That was fun! I never did find all of them but you don't have to find all, just most of them. Bigfish, keep providing and selling pirate-themed games. I think I own all of them but this one is outstanding. I couldn't stop playing once I started it. Highly recommend! Rated 5 out of 5 by swissuz from A Treasure in my Game Box! I loved everything about this game. The sound effects grabbed me right away, and the narrator in certain cut scenes was professional and elegant as he read parts of the story unfolding. I was surprised that some expert gamers didn't like the coins. I found them an added interest. They were not morphing animals or butterflies in the picture for some "virtual" trophy. They were part of the game play. I was frustrated as there were three coins I could not find....but not to worry, they allow a little room for being short a coin or two. The GRAPHICS.....one word WOW! Especially inside the mansion....not the typical dusty dilapidated relic. It was depicted as if the characters still lived there. It was challenging enough for expert gamers on other levels, but I played it on casual to enjoy the artwork and sounds and take in the story. No mystical crazy magic Genie's ......a good pirates tale with all the awesome folklore to go with it! Excellent......superb! Rated 5 out of 5 by SemeleRhiannon from Very Awesome Game in all Aspects I really love this game, but not sure I'll find another like it. Rated 5 out of 5 by Darel_Gaco from Top Two of my Best Youdagames !!! This is why I like some of the games brought by Youdagames, Because you can really say that it was very excellent and great game to buy. 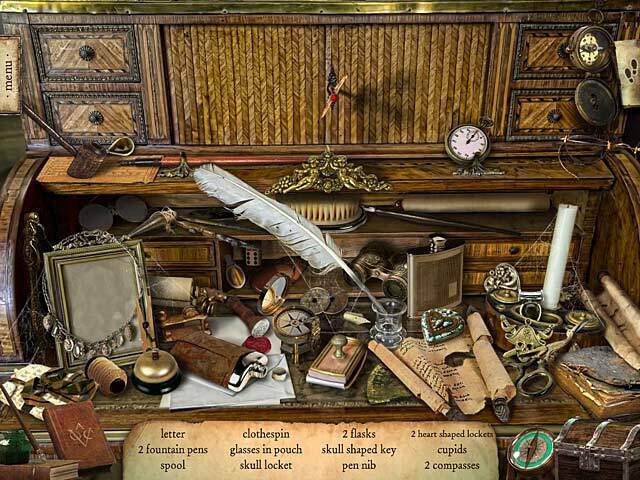 This Youda Hidden object game was on my top 2 of my all time favorite youdagames. You can saw that its likely a real life in every scene you are facing. And I very like on this game was the classics voices that I`ve been heard on so much youdgames I have, behind the reader of the story line, the spirit and more.And also the good quality of their own soundtracks and the creepy sounds you`v been heard all over the castle,Also the voice behinds the woman sang a creepy operatic song, Unravel the mystery of the real story I`am definitely recommended this game........... Good luck hidden object players!!! Rated 5 out of 5 by rosekaufmann from TREMENDOUSLY ENTERTAINING I don't usually even try adventure games. Glad I tried this one - I really like it. It is a sad story and has sad music to set the ambience to match. I like that you can adjust the brightness as there are plenty of games which are dark on some computers, but not on others - so the adjustment can take care of that problem. You should find coins in the scenes, which are used later in the game to open chests you find. The graphics and locations are nicely done. There is a lot to do. Since game isn't linear, you can choose to go in several directions. Never at a loss of what possibilities exist - keeps the game moving at a good pace. I really like this game so far and want to find out what happens to the 2 main characters. Think I'll use a coupon since I've not played an entire adventure game of this sort - just in case my good thoughts don't last. Oh dear! If I continue to like it to the end, then that makes 3 kinds of games I have to buy. Rated 5 out of 5 by beckykay from Bravo!!! Thank you developers - this is a most excellent, beautiful and refreshing game. It reminded me of another of my favorites - Haunted Manor Queen of Death. I almost missed this one - I must learn to not rely on the reviews of others as I'm finding that it's the games that don't get the rave reviews that I'm loving the most, go figure. The graphics are precisely as I prefer them - crisp, realistic, amazing. The game-play/storyline is interesting and the puzzles challenging but not too difficult, I had to skip only a few of them. They were relevant to the story too - necessary in order to enter a room, etc. I loved the coin search and how they flipped into the chests as I found them!!! What fun. I also loved how many areas and rooms there were to wander through. I just loved every single thing about it. This game was pure delight to play, and very very clever. Thank you thank you thank you to the developers and those who put so very much thought into this game. Well done! Please, keep them coming. I give this a standing ovation.